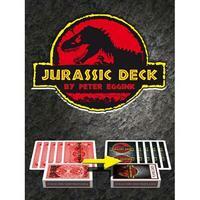 Today, when you order "Jurassic Deck by Peter Eggink", you'll instantly be emailed a Penguin Magic gift certificate. You can spend it on anything you like at Penguin, just like cash. Just complete your order as normal, and within seconds you'll get an email with your gift certificate. 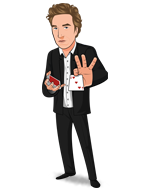 The magician shows a deck of 52 different cards. Different movie Titles are boldly written black on the red back of each card. A movie collector's club prediction card is placed on the table in full view. The magician says "Since I'm a huge movie fan, I wrote the names of 52 of my favorite movies of all time on the back of each playing card. I did this for a reason though. If I can't decide which film to watch, I just pick a card and go with whichever one is on the back". The magician continues "I'm now even able to predict a movie.. allow me to show you what I mean". The magician spreads the deck face up and a spectator is asked to pick any card they see at random (no force). The spectators freely chosen card is placed face up next to the tabled prediction. Magician: "If the movie represented by your freely chosen card matches the movie which is on my prediction card, wouldn't that be impressive?" The prediction is turned face up by the spectator, to reveal the movie "Casablanca"....the spectator's card is turned face down to reveal that "Jurassic Park" is printed there. It seems the magician screwed up, as the prediction and the spectator's chosen card do not match. 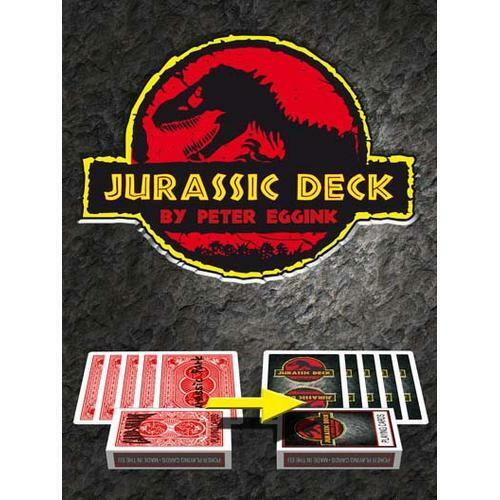 However, the magician waves the whole deck verse the chosen card, and when the deck is turned face down and spread out, the whole deck of cards is changed into a "Jurassic Deck" of cards, matching the chosen card. When the cards are placed back into the box, even the card box changes to the theme of the movie! I was really looking forward to this trick and it was great! The one bad thing was that it has one outcome, and a "wrong prediction" reveal. Very well made. Try to get it on coolbox, though. you get what you see, people have no clue what just happened, deck works perfect with me cause people know i love movies and magic, so this combo is perfect, awesome trick, i'll recomend it, works great all the time and plus its easy. I love the effect. The first time I tried this, the spectator just sat in silence for a few seconds (I guess her mind was registering what had just happened). The entire deck changed before her eyes! Your spectator cannot handle the deck or the card box, but at the right time and place this is a great effect. Everything is just as seen in the video. Highly recommend it. I got this when it was on sale for 4.95 and at that price it's killer. I was a bit disappointed with the method because technically you don't need the deck you get for it. You sort of need it in a way.But after preforming it many times it always gets a wonderful reaction and some people say it is one of my best tricks even thought the method is pretty simple. Get it if you have the money! Don't think if you can figure it out or not, trust me the spectators won't and they will be amazed. I never heard of Peter Eggink, but after receiving this item just for curiosity on how it worked because it most definitely fooled me I now know he has an amazing mind and is very creative. Very well made deck from Card Shark as well. This is a must have trick if you do any kind of magic. I found the unclear instructions on this leaving two outcomes but only explaining one. I have tried to figure out a smooth way to use the second outcome but honestly I can't. More of a novelty than a quality effect.